Roof Material – The material of the roof is not as important as contaminants that may be on the roof. For landscape purposes, the common asphalt shingle will work fine. If you are starting from scratch, we recommend a metal roof because they easily shed contaminants. In all cases, it’s important to avoid wood shingles or metal flashing that contains lead. Slope – The slope of the roof affects how quickly water will runoff during a rain event. A steep roof will shed runoff quickly and more easily clean the roof of contamination. A less-steep, flatter roof will cause the water to move more slowly, raising the potential for contamination to remain on the catchment surface. The roof on the right has a steep slope followed by a more gradual slope. Sizing a Catchment Area – The size of the catchment area or roof will determine how much rainwater that you can harvest. 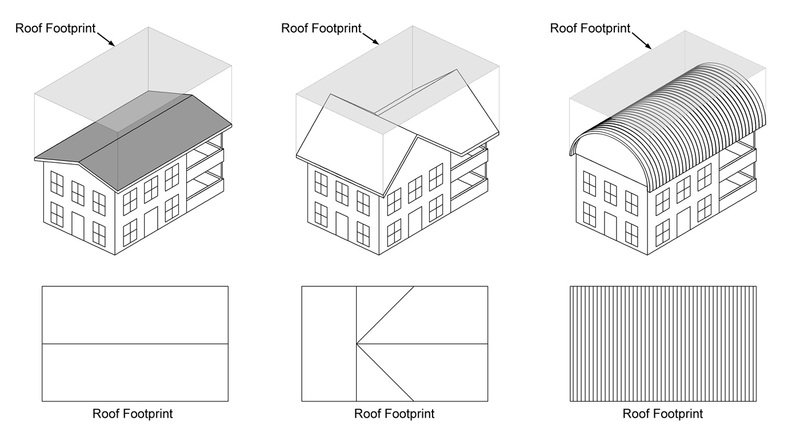 The area is based on the “footprint” of the roof, which can be calculated by finding the area of the building and adding the area of the roof’s overhang. The image below shows how differences in roof slope do not change this building’s catchment area. To calculate how much rainwater that you can harvesting, use the equation below. A more detailed computer calculator can be found at the Calculators page.